Painter Astrid Tuttle has a family camp outside Staunton, and she’s drawing from that in a series of paintings of Old North Mountain that takes the same approach as Monet did to many subjects — different angles, different seasons, different light. She finds that the Valley provides a lot of inspiration for her art, largely through the mountains, farms and fields. Living on a farm, on a hill about two miles from Staunton, she enjoys a panoramic view, and her paintings reflect the hills and valleys that surround us. “I’ve traveled many places, but this Valley is a very special place,” the Cuban-born Tuttle said. 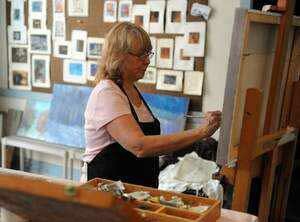 She’s not the first artist to find inspiration in the Shenadoah Valley, nor even the most famous. Folk art painter Grandma Moses lived in Augusta County before moving to New York State. Her Verona home, Mount Airy, was recently added to the state landmarks register, and if you stopped by the R.R. Smith Center in downtown Staunton this spring, you would have seen several of her paintings that featured familiar surroundings. The beauty of the Valley continue to inspire artists of all stripes. 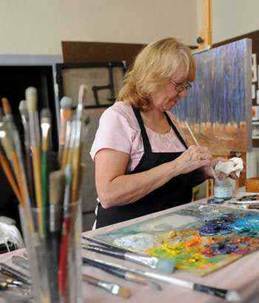 Waynesboro artist Betty Arehart is a Virginia native and has most recently focused on painting near the Tye River in Nelson County. When she got her first digital camera several years ago, she took it a favorite place where she and family used to go bicycling and picnicking years ago. In one stretch of this river there are enormous boulders, and the shapes fascinated her. The camera let her get closeups of the river and boulders. She soon noticed little waterfalls throughout the view as the water tumbled over rocks and boulders, and has since completed a series of Tye River paintings. With all of these artists, it’s clear they love what they do and that this lush and varied Shenandoah Valley continues to beckon, cajole, and inspire artists from the world over. Grandma Moses may have been the most famous to date but the essence of what inspired her continues to draw creative spirits to our countryside to immerse themselves in the magic of these mountains, fields and valleys. Indeed the unifying theme heard from the artists was the incredible variety and beauty found in this place. And their subjects — whether a mountain, a boulder, a field or tree — are the ones they love the most – at that particular time. Arehart, who studied art at James Madison University and Beverley Street Studio School draws on the Valley throughout her work.